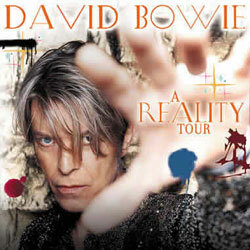 The Australian leg of the Reality tour opened at the 13,500 seater Brisbane Entertainment Centre - the same venue Bowie played on his last visit some 17 years previous. Located 16 kilometres north of the city, the Brisbane concert was indoor and sheltered from what was a particularly notable bout of very hot weather - even by Brisbane summer standards. By 7 PM, the area outside the arena transformed into a beacon of activity and several fans dressed up to mark the occasion - some complete with Aladdin Sane lightening makeup. 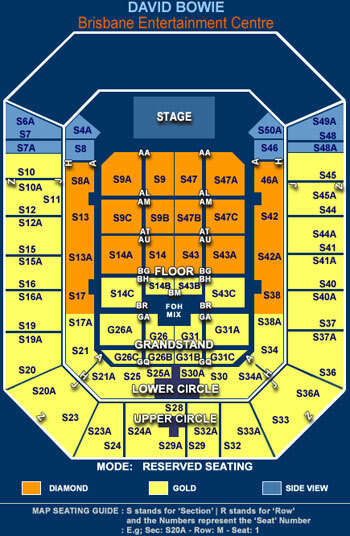 BEC David Bowie Ticketek map and BEC Time Sheet. 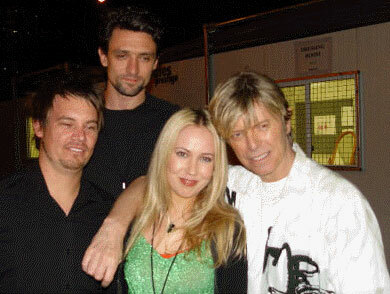 The opening act was Something for Kate - as was the case in all following Australian shows. 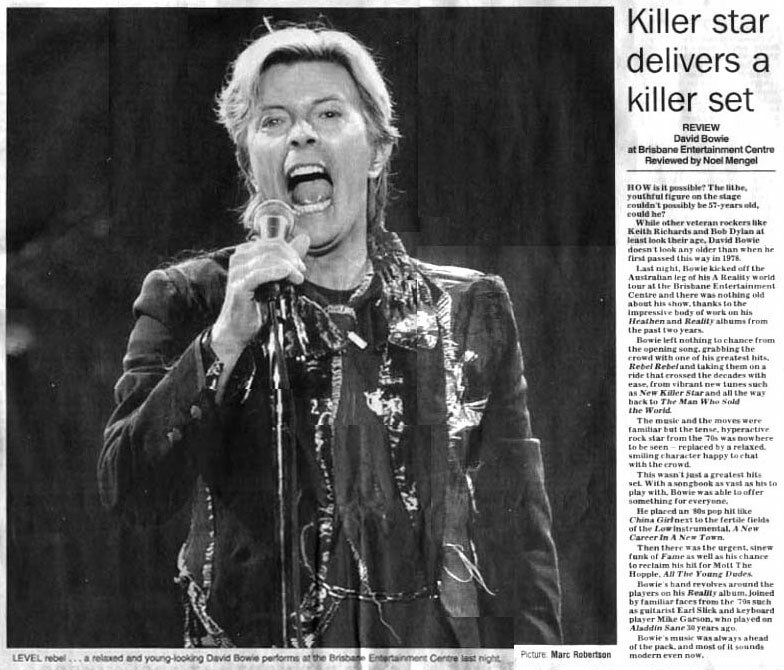 Bowie and Something For Kate. 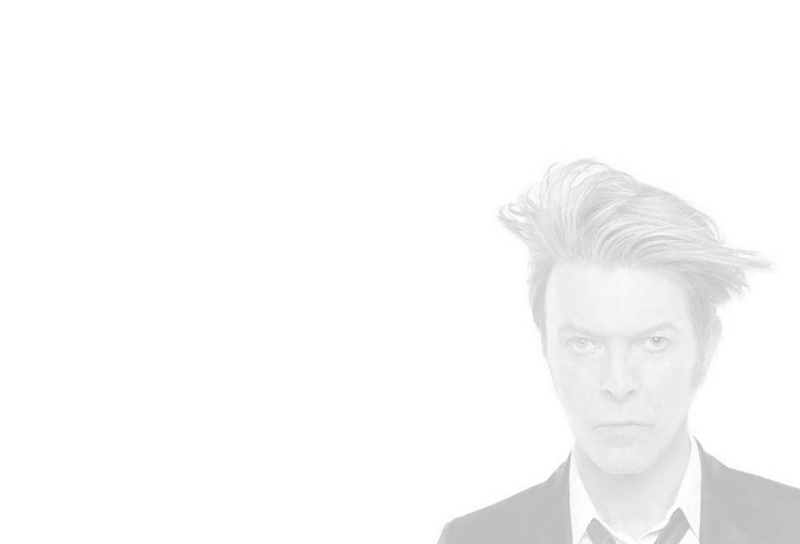 At around 8:45, Bowie took the stage. As in Wellington, the start-up involved an instrumental jam before 'Rebel Rebel' kicked in. 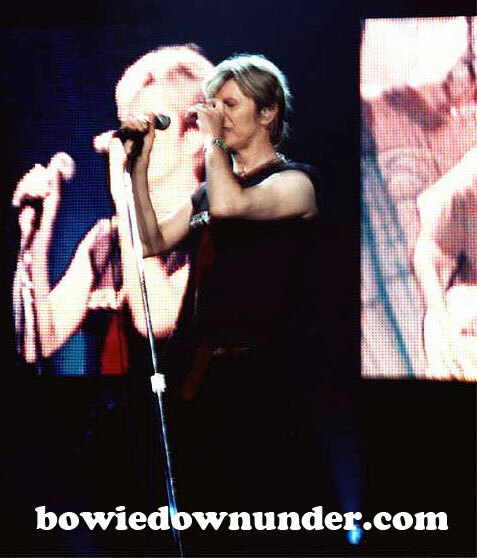 Again, after a rousing version of 'All The Young Dudes', Bowie invited the audience to sing 'China Girl' from the very beginning! - but as to be expected, the audience fumbled. 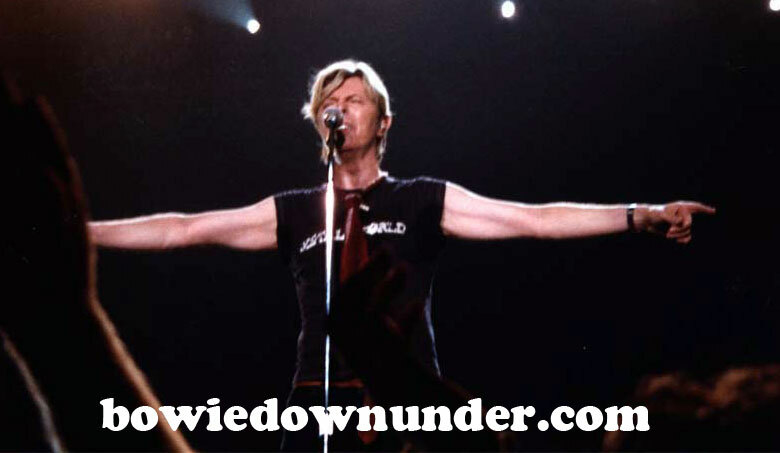 Bowie was in a playful mood - on several occasions, getting down into a sprint position and running towards the front of the stage to entice the crowd. 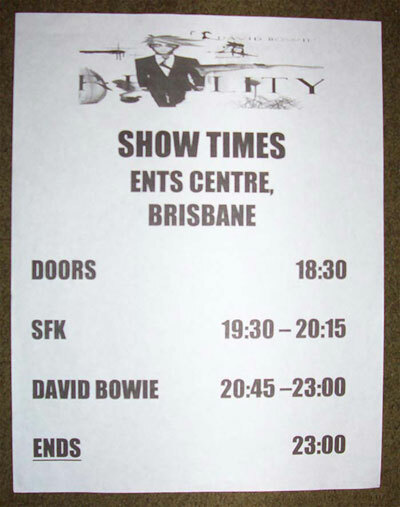 Bowie in Brisbane. Photo by Adam D. Camera security at this show was unbelievably tight but was fortunately eased up in subsequent shows. 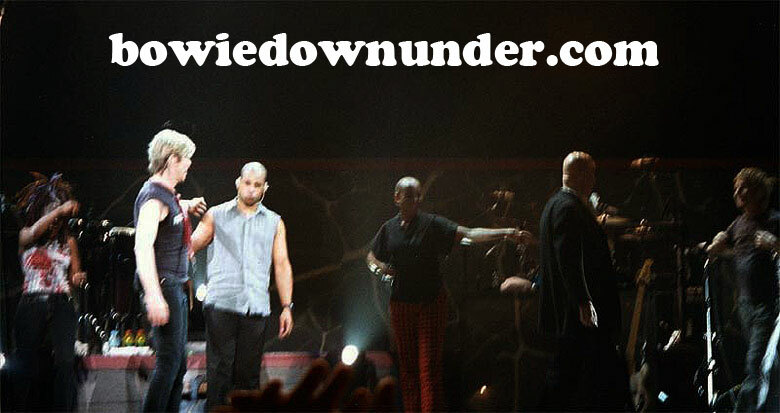 Debuting downunder was 'Looking for Water' which became a staple throughout the remaining Oz shows. Another surprise was 'Always Crashing in the Same Car' which appeared in the encore. 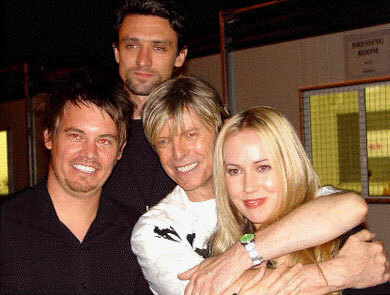 During the band introduction - just before Bowie introduced Gail Ann Dorsey - BDU member Anthony yelled out the name "Hollywood" to which David laughed and replied " Hollywood? What has that got to do with the price of chips? Hollywood. Alright. Ummmm" before Gail Ann explained that 'Hollywood' was a name she used on a Velvel record. 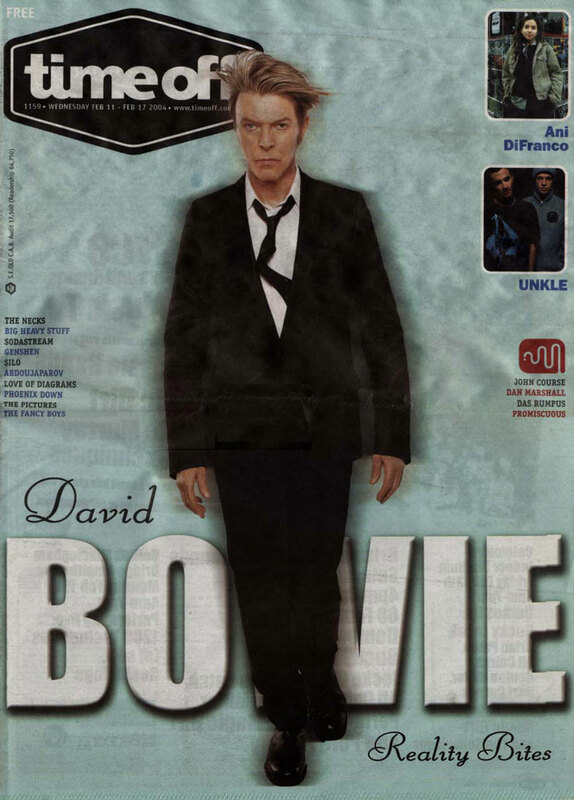 'Ziggy Played Guitar'. 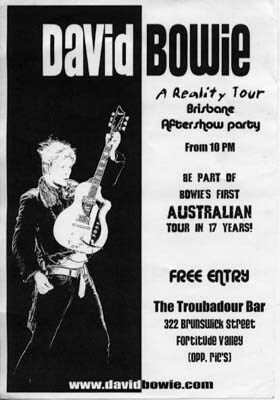 Photo by Adam D.
Following the concert, many fans decided to rock on at the Troubadour Bar in Fortitude Valley. The following day, reports in the press were ecstatic. 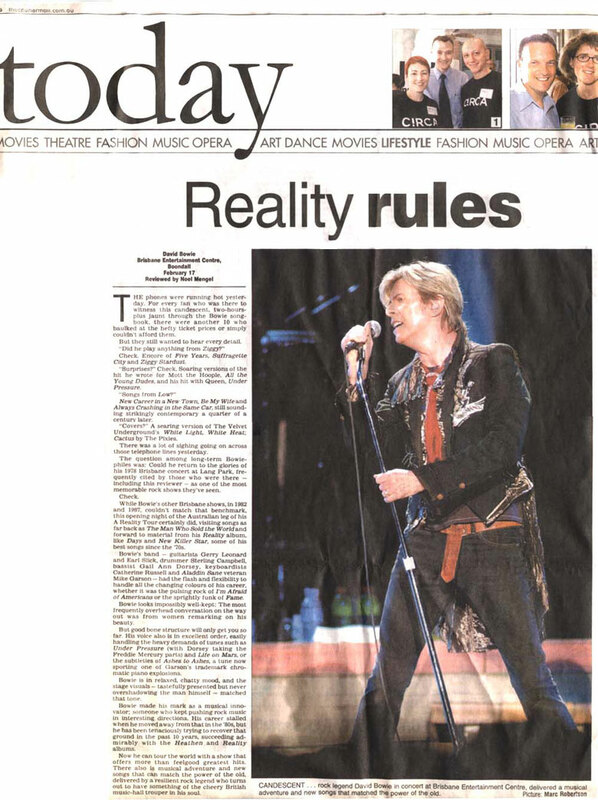 Securing most of page 3 of The Courier Mail, Noel Mengel reported that Bowie's show was better than his 1983 and 1987 concerts and on a par with Lang Park, 1978 - a show that is frequently cited as one of the most memorable rock concerts among those who attended. Page 3 of The Courier Mail, Feb 18 2004. Front page of the Today section of The Courier Mail. 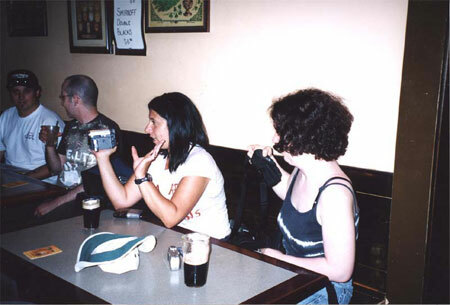 Front cover of local music rag Time Off, Feb 11-17, 2004. 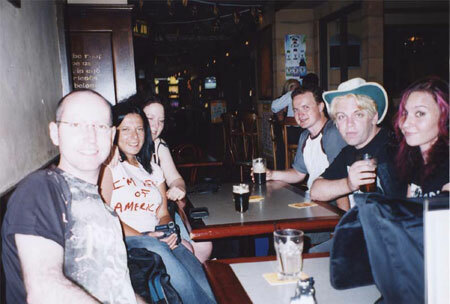 Brisbane, Feb 17, 2004. For more info click here. Click here for the complete concert transcript.